Longridge Town manager Lee Ashcroft has praised the club’s board after they confirmed an intention to apply for promotion into the Hallmark Security League. Club secretary Dave Walker told the Longridge News last week of the club’s plans, as well as the scope of work required in order to become eligible to play in the former North West Counties Football League. 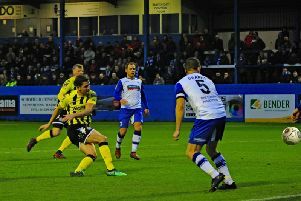 “We’ve talked about this since I came to the club four years ago, so it is good to see that the committee are showing the ambition that we discussed back then,” Ashcroft told the club’s website. Just to clear up matters further, any eventual promotion to step six is not necessarily dependent on how Town perform during the course of this season. Last Saturday’s loss against Fulwood Amateurs leaves the defending champions sitting sixth in the West Lancashire League Premier Division. The gap between themselves and the current leaders, Blackpool Wren Rovers, is presently 24 points with Town having seven games in hand. Although two other West Lancashire top flight sides have also applied to move up the pyramid, namely Garstang and Whitehaven, it does not mean Town have to finish in the top three this season. For their part, Garstang are holding a committee meeting on Tuesday evening to decide whether they should continue with their application. “The FA might be cherry-picking specific teams with specific facilities,” Mr Walker explained. Town return to West Lancashire League action on Saturday when they travel to Tempest United (2pm).